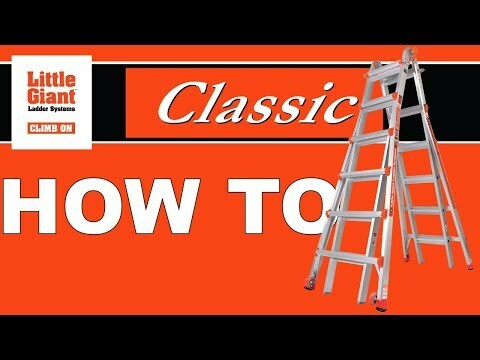 When used correctly, the Little Giant Classic™ is the strongest, safest, most versatile ladder in the world. The Classic’s patented Triple-Lock™ Hinge and telescoping sides make it a true multi-use ladder. In fact, the Classic can be used in dozens of unique configurations, as an A-frame, extension, staircase and 90-degree ladder, and as a trestle-and-plank scaffolding system. You will enjoy an unmatched feeling of safety and stability on the Little Giant Classic. It is constructed of heavy wall, aerospace-grade aluminum, and its wide-flared legs give it a feeling of stability you cannot get with a traditional A-frame or extension ladder. The Little Giant Classic is rated to hold 300 lbs. on both sides and is a true two-person ladder. The Classic Ladder is available in 13, 17, 22, and 26-foot sizes. I have had this ladder since 1997. I LOVE the ladder! I have had the ladder 10 years. I use it every day. I show it to many people all of the time. I have probably sold dozens of them for you over the years. I love the ladder and loves showing it to people! I swear by my ladder. It has fallen off on the freeway a couple times and it didn't hurt it one bit. I have had this thing almost as long as you've been making them! I have sold a lot of them for you. I always refer people to the California state fair. The only complaint I have is that it's a little on the heavy side, but that is to be expected in such a solid sturdy product. I actually figured out how to carry it and it made it easier. I took off one side and carried it upstairs. I can get into so many different places with this ladder. I feel so safe and secure on the Little Giant. I have a huge picture window with stairs underneath that I was never able to get to before, also I am able to clean the deck. There is a wallpaper project in my bathroom I couldn't reach. I also have vaulted ceilings with light bulbs that I was never able to reach and change before. My dad had a leak in his roof. I made him use it and he was able to use it and he is 78 years old (he didn't say anything about the weight so I guess I need to start lifting weights!) Keep up the good work Little Giant Ladders!!! Not only is it a ladder, I use it for scaffolding. I have had the ladder 15 years and I like it very much! A-Frame Min. Height 3 ft. 4 in. 4 ft. 4 in. 5 ft. 4 in. 6 ft. 4 in. A-Frame Max. Height 5 ft. 3 in. 7 ft 1 in. 9 ft 1 in. 11 ft. 1 in. Extension Min. Height 7 ft. 9 ft. 11 ft. 13 ft.
Extension Max. Height 11 ft. 15 ft. 19 ft. 23 ft. Storage Width at Base 2 ft. 2 ft. 0.5 in. 2 ft. 3.5 in. 2 ft. 7 in. Storage Depth 8 in. 8 in. 8 in. 8 in. Max. Footprint 3 ft. 10 in. 5 ft. 1 in. 6 ft. 7 in. 7 ft. 8 in. Rung Size Single Section Inner: 1.25 in. Outer: 1 in. Inner: 1.25 in. Rung Size Double Section 3.25 in. 3.25 in. 3.25 in. 3.25 in. Ladder Weight 29 lbs. 37 lbs. 45 lbs. 56 lbs. Shipping Weight 34 lbs. 42 lbs. 52 lbs. 65 lbs.